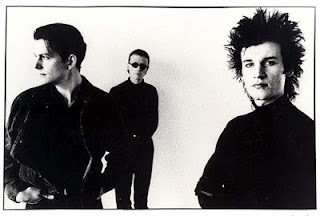 Photo from the Love And Rockets Facebook page. Here’s a memory from the days when the Illinois Entertainer mailed vinyl records to me in big cardboard boxes. This review appeared in the February, 1988 issue, with writer Jae-Ha Kim’s cover story on the Chicago band Colortone. It also included my interview with singer Jimme O’Neill of The Silencers and Fingerprintz. The second effort from Love And Rockets finds the former Bauhaus and Tones On Tail members following the successful formula of their debut, Express. There’s an entertaining mix on Earth - Sun - Moon of high-speed dance tunes and atmospheric ballads featuring acoustic guitar. In either case, Daniel Ash’s vocals are consistently engaging (particularly when he harmonizes with bassist David J.) and the band’s complex arrangements frequently have a haunting effect.